These Land and Buildings can be ideal for school, Guests house for company Lodge and or company office. Well-built bungalow with ample parking space in a beautifully serene neighborhood with exceptionally good power supply. ...Of Office Space For Long Term Lease. 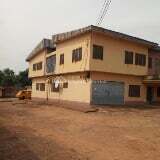 The Property Is At Housing Estate, Opposite Coca Cola Company, Along Bridge Head, Onitsha, Anambra State. 2695m2 plot on Works road GRA, fenced and gated with a 3 bedroom bungalow plus C of O, now available for Sale for 60 million! This House Is Located By Cosmilla Awka. Steady Power And Water Supply. An 8,713 square meter plot at Golf Estate for Sale for 150 million. Please contact me right away for more details and inspection! 500 Sqm at New GRA Enugu on a very Beautiful place. The land have a general C of O: fenced with gate: 12 Million Naira.